We drove westward along the southwestern coast of Turkey from Antalya to Kaş in one day, although it’s a pretty long day (187 km of winding and beautiful coastal road) including several stops. After our first stop at the great beach and ruins of Phaselis (click here), we continued westward stopping at Cirali and Myra before getting to Kaş for the night (for a general map of our stops click here). This stretch of southwestern Turkey is known as the Lycian Way, due to the ancient Lycian civilization which inhabited this area and left many traces behind. This is a laid-back backpacker’s beach hangout about 7 km from the main highway with cheap ‘treehouse’ accommodations (think sleeping bags on wooden floors above ground level in the open), very casual outdoor cafes and a good (although with very little shade) beach. No wonder this stretch of Turkey is known as the Land of the Sun. 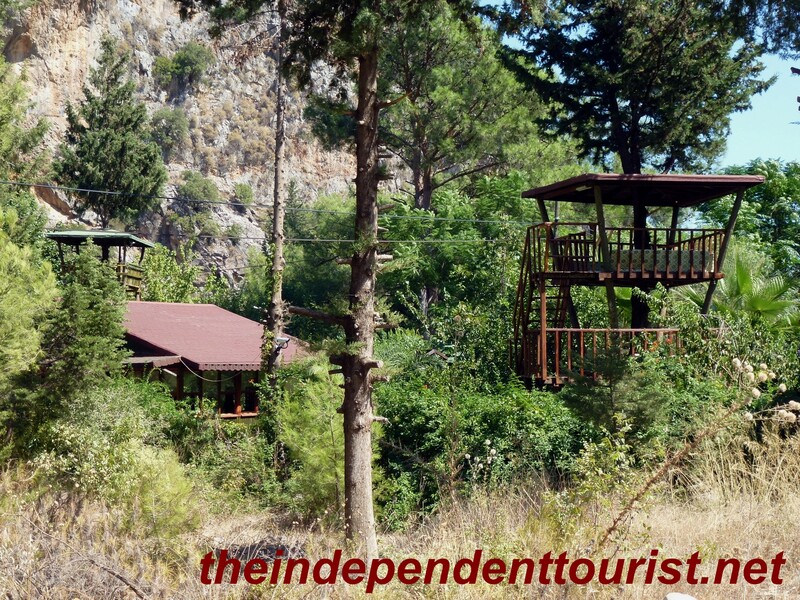 Examples of the “tree house” accomodations in Cirali. The beautiful beach at Cirali. Not far from here are the enduring flames (from escaping natural gas), known as Yanartaş (“burning stone”), but since we visited during the day, we did not take the 2 km hike to the flames. If you try to blow them out, they immediately light again. In ancient times, these flames helped provide a beacon to ships. 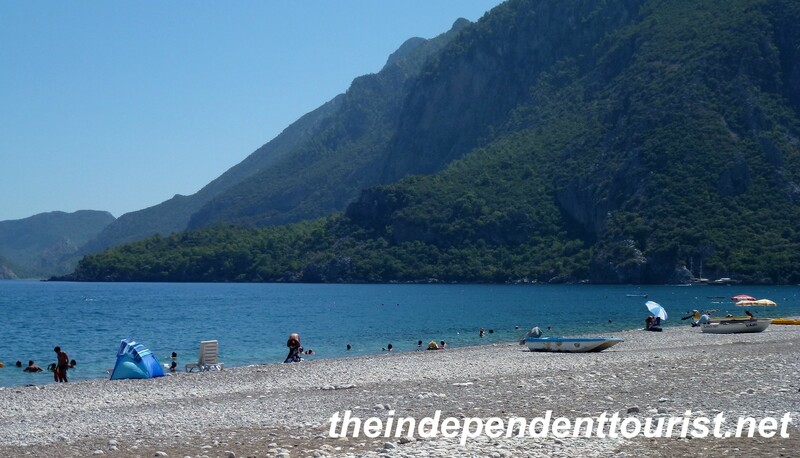 This beach is also close to the ruins of Olympos, which we unfortunately did not have time to visit. 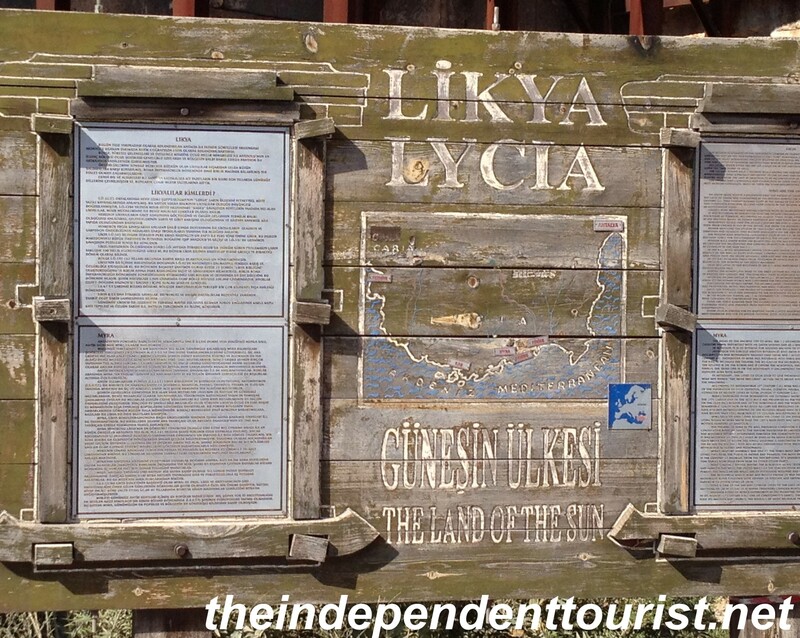 The history of Myra and Lycia – Land of the Sun. Myra – note the tombs in the hillside. 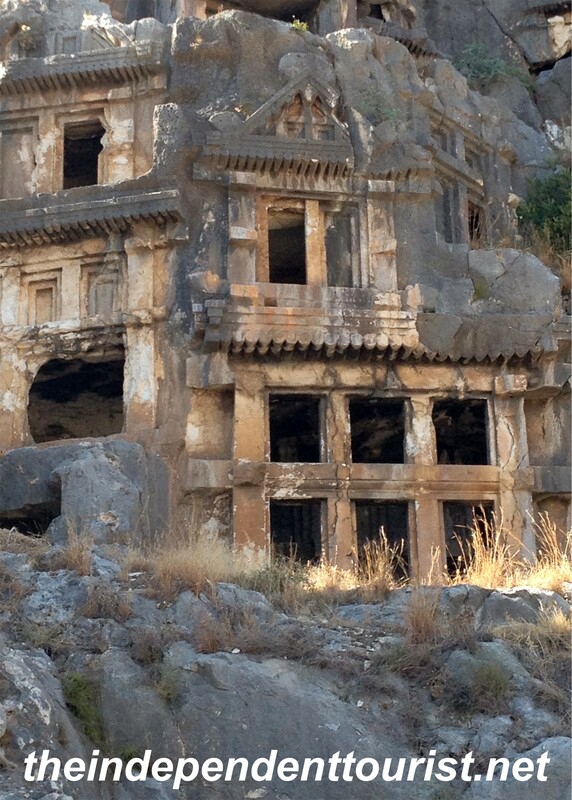 View of the rock carved tombs at Myra. The ancient city of Myra is just 2 km inland from Kale (no problem locating it with the excellent road signs). 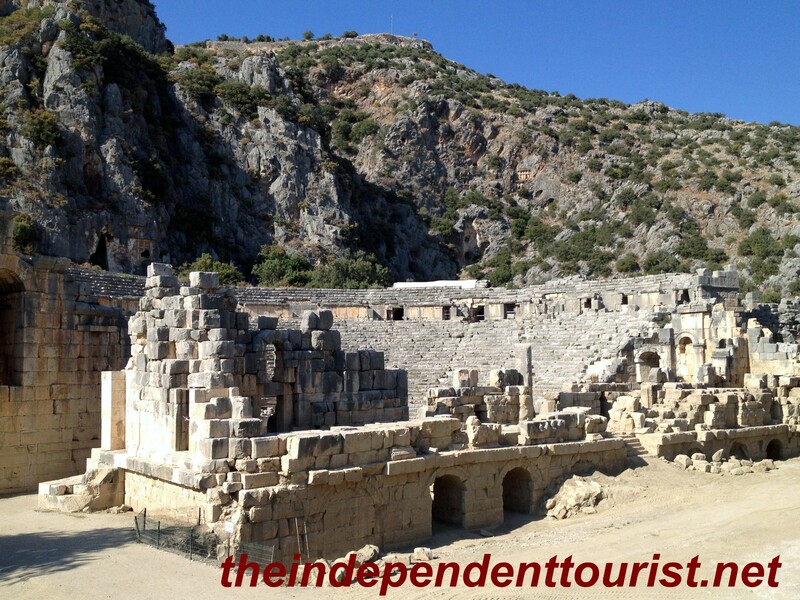 Myra dates from 5th century BC and was a significant port city. 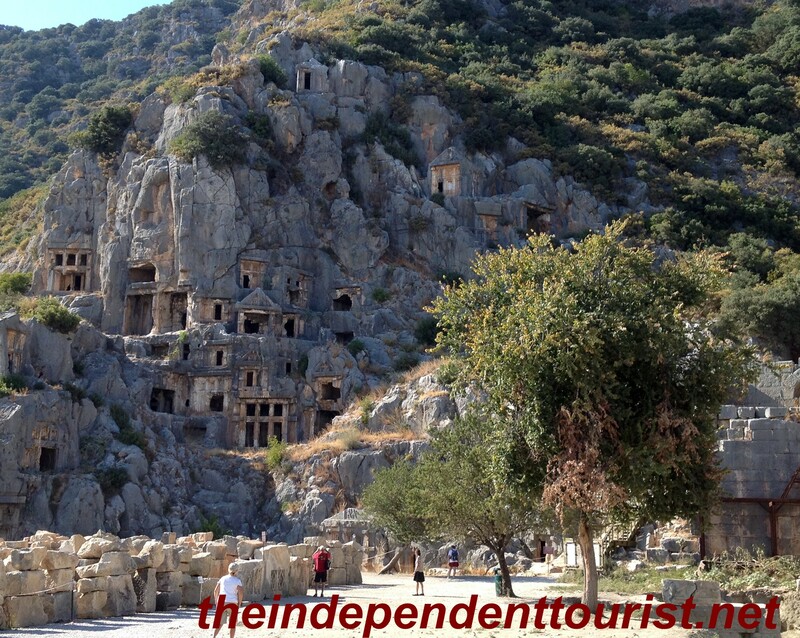 It was one of the major cities of the Lycian League. Myra is mentioned as a stopping point in St. Paul’s journey to Rome in 60 AD (see the New Testament, Acts 27:5). 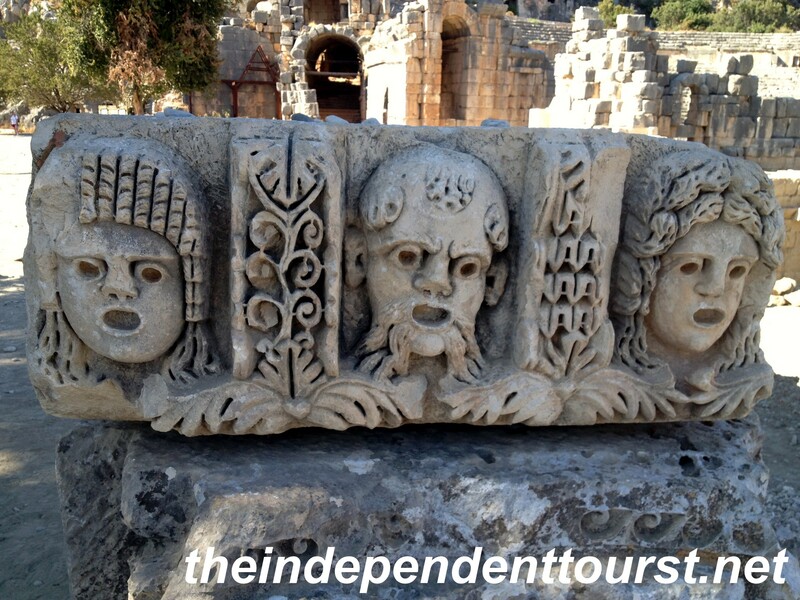 Stone carving of actors’ masks at the theater in Myra. The Roman theater at Myra. It became part of the Roman empire in 43 BC. Later, in the 4th century under the Byzantine Empire, Myra had its own bishop, St. Nicholas (died 343 AD), who eventually became today’s Santa Claus (“Jolly Old St. Nicholas…”). St. Nicholas is the patron saint of Russia and lots of Russians love to make the pilgrimage here. 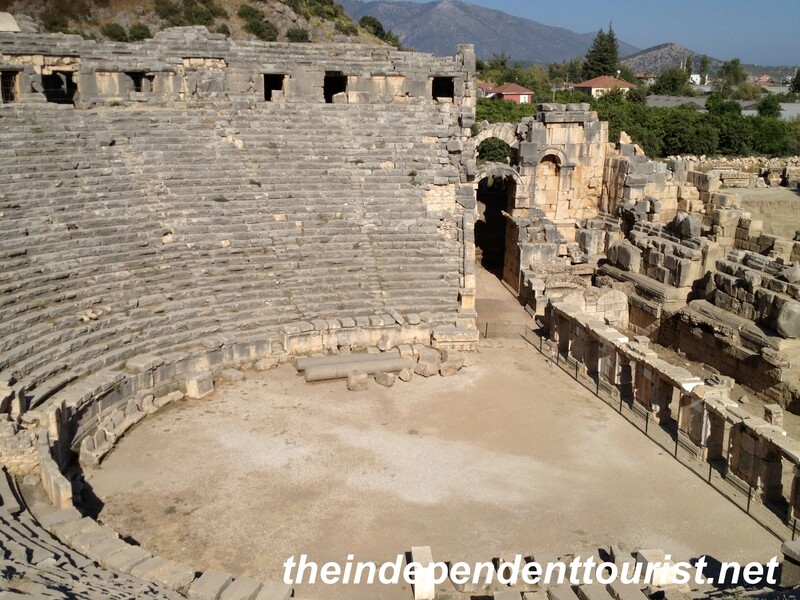 The theater at Myra is huge and the nearby house tombs on the hill are a great example of Lycian architecture. The entry fee was 15 TL per person (1.8 Turkish Lira per USD). Another view of the theater at Myra – there is a fortress at the top of the hill in the distance and tomb in the distance above the theater. If I had had any idea how much there was to do around Kaş (pronounced “cash”), we would have spent more than one night here. 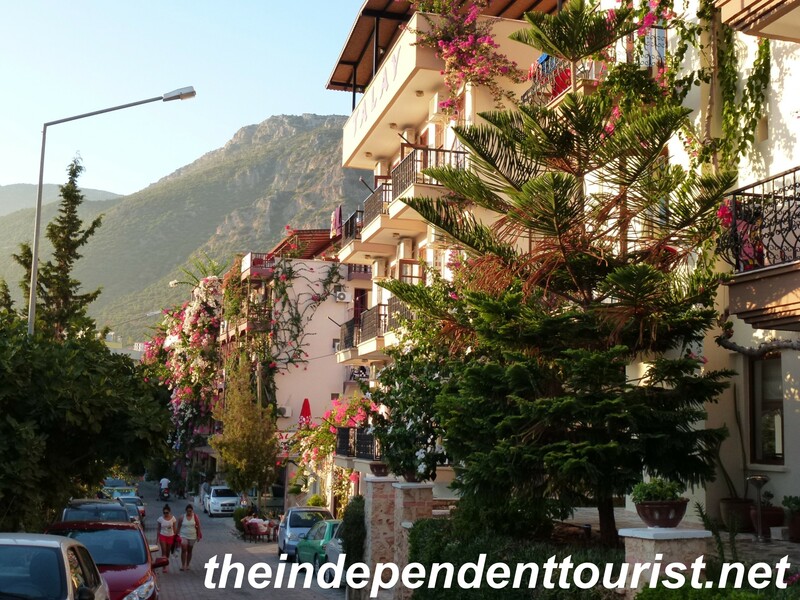 A street scene in Kas. The bougainvillea are everwhere. 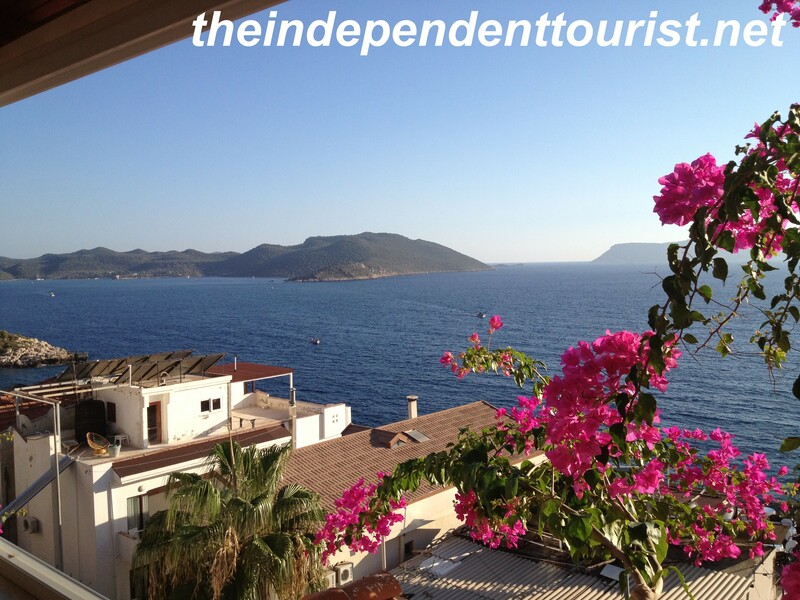 The town is in a beautiful setting, nestled on a steep hillside, with views of the Greek island of Meis (or Kastellorizo) just offshore. We had a good hotel here (Hotel Kayahan), with a fantastic view overlooking the harbor. The only downside to the hotel was that parking is extremely limted–we ended up parking about 200 yards away in a town square. View from the terrace of the Kayahan Hotel. 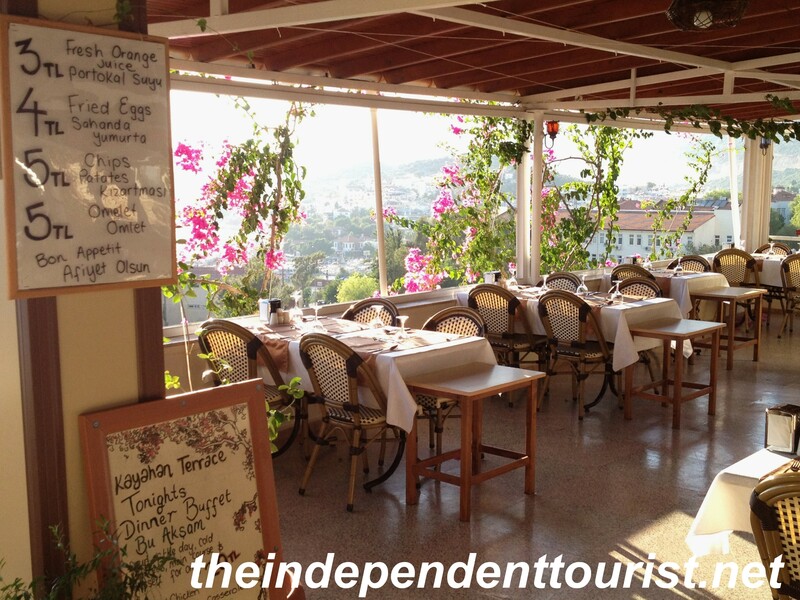 The terrace dining area of the Kayahan Hotel. There are lots of day-trips by boat to be had out of Kaş, with options including secluded beaches, snorkeling, sea kayaking, sunken ruins (such as Kekova Island), a ferry ride to Meis or just lazing around Kaş itself. It would be very easy to spend an entire week in this spot with no chance of getting bored. Myra looks amazing, makes me wanna go!